Why did Rousey interfere in the Charlotte vs. Becky match? It was the second squash match of the night at Fastlane. Shortly after Kofi Kingston faced insurmountable odds against The Bar, Becky Lynch went up against Charlotte Flair. If she were to win the big match, she would be added to the WrestleMania 35 main event. It did not look good for Becky Lynch from the very start. She arrived on crutches, hobbling and stumbling to the ring. Charlotte Flair worked on Becky Lynch's leg for the duration of the match, absolutely crippling her. And when it seemed like Charlotte Flair would pick up the win, Ronda Rousey's music hit. Ronda Rousey is the one who's been pushing for Becky Lynch to be added to the WrestleMania 35 main event. This is because things have gotten incredibly personal between the two women involved. In fact, the whole rift between Stephanie McMahon and Ronda Rousey first happened when she demanded that Becky Lynch be added into the match. Becky Lynch and Ronda Rousey have made things very personal on Twitter over the last few days. The rivalry began around Survivor Series when Becky Lynch invaded the RAW locker room and put away the RAW Women's Champion. 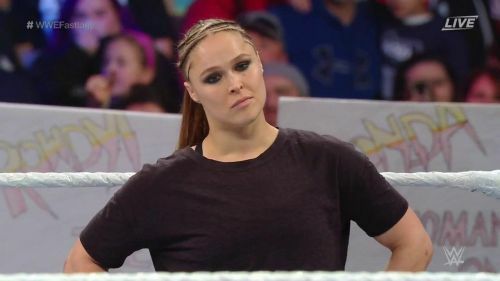 Ronda Rousey wants to destroy Becky Lynch, in storyline, in the ring at WrestleMania 35.